One planet that is nearer to home and very bright and constant in our evening skies at the moment in the constellation of Gemini is the planet Jupiter. On the Saturday night of our Stargazing Live star party at Henley Golf and Country Club we saw this beacon of light through a number of telescopes and binoculars set up on the tennis courts. In fact we were able to show the public not only the planet but, to either side of it, its moons as seen long ago by Galileo. Sadly, although we were present at the Club on Friday January 10th plus the Saturday and the Sunday, the weather was not very cooperative and we only managed to observe on the Saturday evening. That night was our busiest with at least a few hundred people able to look with wonder at the lunar craters, the Orion nebula and twinkling stars of various colours. When visitors needed to warm up between observing sessions or on the cloudier nights they could visit the clubhouse where there were talks about how to find your way around the night sky, displays and free night sky calendars courtesy of the BBC, as well as hot food and drinks from the bar. 12-01-2014 18:30 The weather forecast has been correct this year. As expected, it rained on Friday, was clear last night and is raining again tonight. We had a very busy night last night and tonight we are back with talks, telescopes and other displays indoors. Because of the rain we won't be observing tonight but do come along and find out about astronomy. 11-01-2014 19:15 Tonight it is clear and we already have around 150 people out observing the night's sky. We will also have presentations and displays in the club house. 10-01-2014 22:00 Despite the poor weather (it was raining!) we had over 80 visitors tonight. Tomorrow we expect to have clear enough skies to get the telescopes out and show everyone the stars. 10-01-2014 19:30 Although it is cloudy tonight, we have presentations and a number of telescopes indoors. Come and join the 40 or so people that are here already! At the moment we are hopeful that we will have clear skies tomorrow. Following the great popularity of "Stargazing Live" in recent years, Professor Brian Cox & Dara O'Briain will again be hosting exciting BBC TV programmes on astronomy in January 2014. As in the last three years Stratford upon Avon Astronomical Society will be following these programmes up with a free public "Star Party". We will be running a range of interesting activities for people of all ages, each evening from Friday 10th to Sunday 12th January from 6:30pm to around 10:00pm. This will be an opportunity for you, your friends, children, to see planets, moons and galaxies as well as to learn about astronomy and telescopes. This year we will be based at Henley Golf & Country Club in Henley-in-Arden. In the event of cloudy skies we shall use the club house to show you videos, telescopes and discuss topics of Astronomy and Cosmology. The BBC has again been helpful and provided us with colourful calendars showing astronomical events for the year. 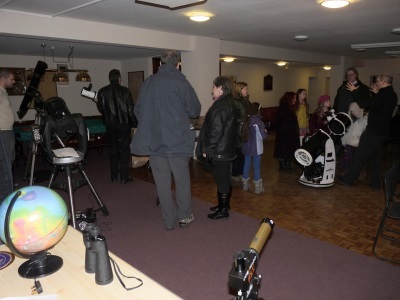 In previous years we had great nights with around 200 people attending on the clearest night. The photo on the right shows some of the telescopes which were on display last year. There will be experts available to help visitors with advice about astronomy, telescopes and any other questions visitors may have. We also plan to have indoor briefing sessions to brief people about what can be observed that night, so as to make their skywatching more effective when they go outside. More details of the 2014 event will become available week by week and we will "spread the word" online via this site, Facebook and Twitter, so please keep an eye on our news. Henley Golf and Country Club is an excellent venue for these events because it is located in an area that is much less light-polluted than many adjacent districts and offers a wide panorama of the sky. The Golf Club will provide hot food & drinks along with a licensed bar.